This property had every amenity possible and was very close to Disney springs. However there were parts of the hotel that need some maintenance or renovations. Our second took after our flight had cancelled, had the worst loud air conditioning fan every time it would kick on. Walls seemed to be pretty thin. All was good besides that though! The staff was extremely helpfull and made the check in and check out process extremely delightful! The grab & go restaurant located on the 1st floor had exceptional selection after a long day enjoying the parks! The pool area also had great activities for the children and adults!! The pool staff were all wonderful! When we checked in we got the wrong room. We were supposed to get a room with a balcony but didnt. We went back and exchanged for the correct room which we waited many hours for. When I finally went up to complain, the room suddenly became available. It was very loud. The interior corridors had slamming doors all night long. you could not sleep past 8am. Also the hotel was very very crowded. Lastly being at Disney we expected to pay a lot, but this hotel had prices that far exceeded Disney. $15 dollars for a drink is way way too much. Sadly after our first visit there, I doubt Ill be back. The hotel location and the hotel itself was nice but do not get the rooms on 5th floor. It is noisy from the lobby and the walls are thin. Could hear my neighbor in the middle of the night. Disney Springs® is within a mile (2 km) of Hilton Orlando Buena Vista Palace - Disney Springs® Area, and other popular sites like Disney's Typhoon Lagoon Water Park are within a couple of miles (3 km). This 1011-room, 4-star resort welcomes guests with 2 outdoor pools, 5 restaurants, and a 24-hour fitness center. There are multiple options for onsite dining with 5 restaurants, including LETTERPRESS, which specializes in American cuisine and serves breakfast, lunch, and dinner, and SHADES with its pool views. Savor a meal from the comfort of your room with 24-hour room service, or get a quick energy boost at the coffee shop/café. Buffet breakfast is offered for a fee each morning from 7 AM to 11 AM. An LCD TV comes with cable channels and pay movies, and guests can stay connected with WiFi and wired Internet. Beds sport premium bedding and the bathroom offers a hair dryer and free toiletries. Other standard amenities include a refrigerator, a coffee maker, and a laptop-compatible safe. Guests of Hilton Orlando Buena Vista Palace - Disney Springs® Area enjoy 2 outdoor pools, a lazy river, and a health club. Valet parking is available for USD 30 per day. The 24-hour front desk has staff standing by to help with dry cleaning/laundry, securing valuables, and tours or tickets. Additional amenities include WiFi in public areas, a conference center, and a business center. LETTERPRESS - Pool-view restaurant specializing in American cuisine. Open daily breakfast, lunch, and dinner. Kid's menu available. SHADES - Poolside family restaurant and bar specializing in American cuisine. Open daily for brunch and lunch. Kid's meals available. CITRUS 28 - Cafe open daily for breakfast and lunch. Kid's menu available. SUNNIES - Pool-view lobby lounge specializing in American cuisine. Open daily for lunch and dinner. In-Room Dining - Restaurant specializing in American cuisine. Open daily for breakfast and dinner. Kid's menu available. 2 outdoor swimming pools are on site, and the resort also has a lazy river and a health club. Disney FastPass+ and Extra Magic Hours Benefit Awaits in 2019! 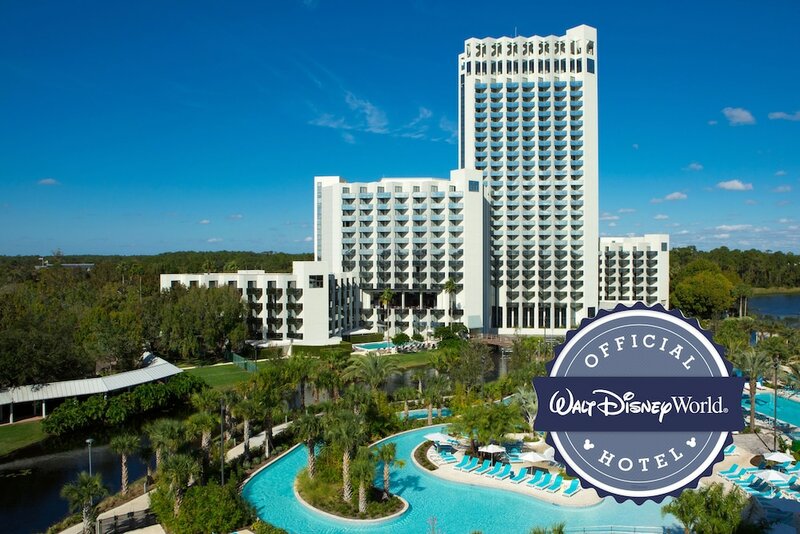 Guests of Hilton Orlando Buena Vista Palace - Disney Springs® Area can enjoy both 60-day advance Disney FastPass+ access and Disney Extra Magic Hours benefits during their stay for travel now - December 31, 2019. The Disney FastPass+ AND Extra Magic Hours benefits are available with valid Theme Park admission. Valid Theme Park admission and Extra Magic Hours benefit vouchers are required. To visit more than 1 theme park on the same day, guests must purchase the Park Hopper(r) Option or Park Hopper(r) Plus Option with their theme park ticket. Extra Magic Hours benefit must be used during the dates of your reservation. Please note that not all Walt Disney World(r) Theme Park attractions are available during Extra Magic Hours. Extra Magic Hours schedule and available attractions are subject to change without notice. Valid Theme Park tickets required. Requires enrollment in the MyDisneyExperience app and linking your hotel confirmation and Walt Disney World Theme Park tickets to your account! Offer valid through 12/31/2019. Disney FastPass+ attractions and entertainment experiences, the number of selections you can make, and available arrival windows are limited. Offer subject to availability. Other restrictions may apply.